Pest control has been done the same way for over 80 years. Finding pricing, coordinating schedules and service is a complicated dance between an office a field technician and a pushy salesman. Balanced Home sets out to change all of this. Seamless online pricing, scheduling and payments and fully organic service. Designed and developed the entire stack for this entire project, from web to print. 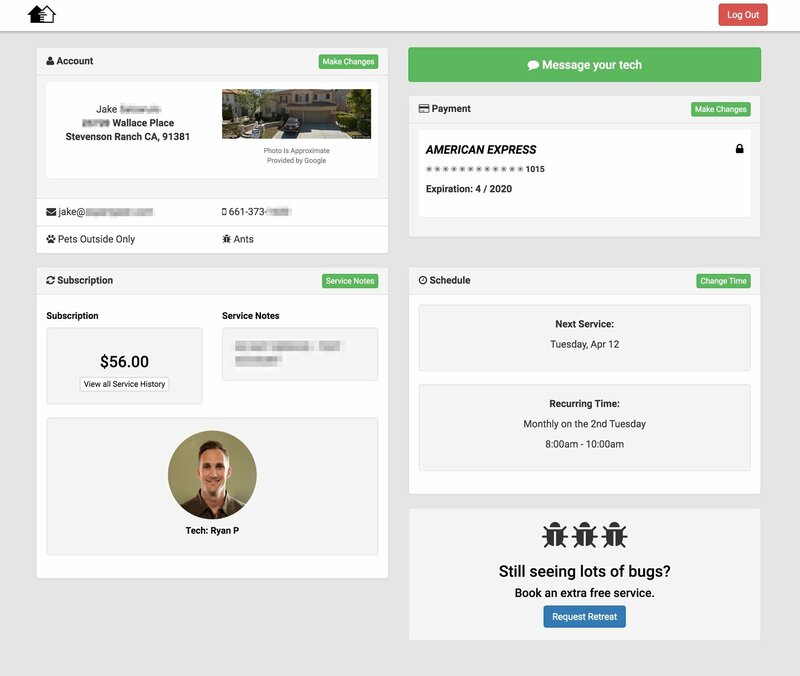 The platform allows customers to book service, reschedule, pass along notes to their technician and more. A simple, single portal to that connects you to your service and technician. A lot of thought was put into the cancellation flow. 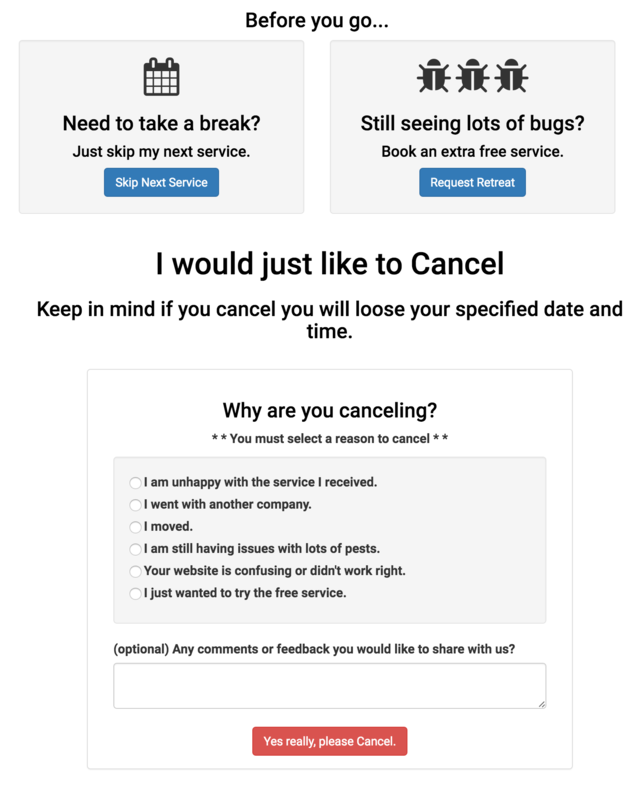 We wanted to ensure that customers felt like they were in control of their account, and like it wasn't too difficult to cancel. However, we also wanted to weigh this against the desire to retain recurring customers. That's why a "Skip Next Service" and "Request a Retreat" options are front and center. The field technician has the power to do whatever he needs right from his tablet. Communicating with customers, coordinating reschedules and more. The integrated, self service structure of the platform completely eliminates the need for an administrative office to sell and coordinate service. 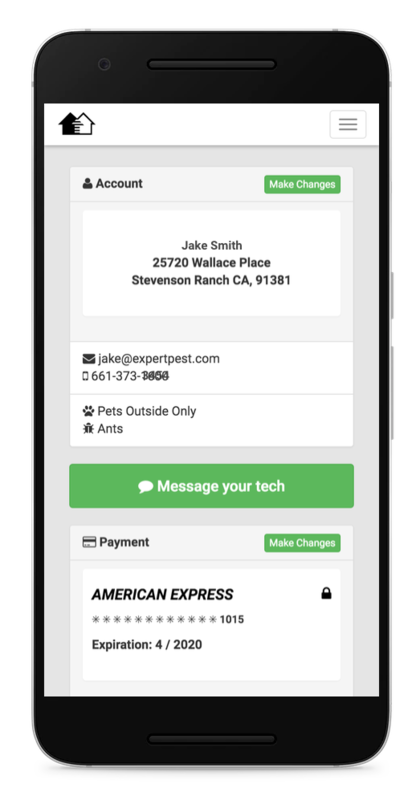 The technician works directly with the customer through the web app. Everything a technician needs is at their fingertips. 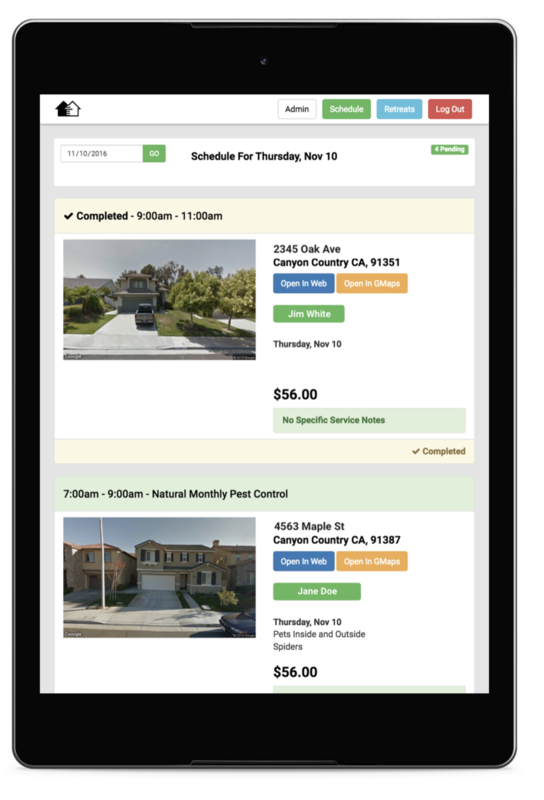 All of the upcoming service schedule with customer's notes, even a photo of every house on the route is automatically there for the technician. Designed and implemented all front end design, content and marketing materials. Blog, Frequently Asked Questions, home pages and more. Ensured that the entire stack was on message and on brand. Implemented a marketing strategy in line with the brand's look, feel and culture. Small details such as only using sustainable, recycled materials. Content centered around sustainability, family and simplicity drove the messages. Custom designed business cards. Bold and colorful. Printed on recycled materials to embrace the ethos of the brand. Designed and executed a door to door mailings campaign to get the word out. Designed and executed a series of targeted ads on Facebook. One of the many ad campaigns designed and promoted.